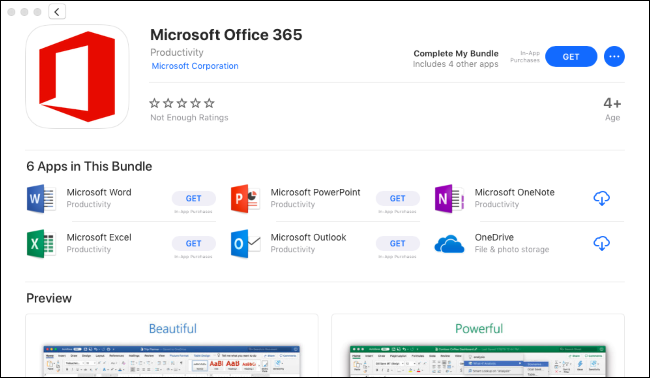 Microsoft and Apple just added Office 365 to the Mac App Store. That means you never have to use Microsoft AutoUpdate on Mac again—just install Office from the App Store and the App Store will update it. If you use Microsoft Office on Mac, you’re probably familiar with this annoying updater. We’ve encountered all kinds of problems with it, including updates taking forever to download and updates stalling partway through. While writing this article, we launched Microsoft AutoUpdate and it downloaded an AutoUpdate update. It then restarted and downloaded a second update for itself. After the third restart, updates for our installed applications like Word, Excel, PowerPoint, Outlook, and OneNote finally appeared. But you don’t have to struggle with that updater anymore. Just uninstall Office from your Mac and then install Office 365 from the Mac App Store. Assuming you’re an Office 365 subscriber, you can just install it and use your existing Office 365 account to sign in. The Mac App Store will then handle updating your Microsoft Office apps in the future. No more Microsoft AutoUpdate! Unfortunately, if you purchased a boxed copy of Office for Mac, you’re out of luck. You have to keep using the old Microsoft AutoUpdate updater. This feature is just Microsoft’s Office 365 subscription service, which Microsoft is slowly encouraging everyone to use.